Any regular reader or customer of The Rake will undoubtedly be aware of our abiding veneration for Rubinacci, a family-run Neapolitan tailoring house with which we have developed an important and mutually fulfilling relationship throughout our 10-year history. As Naples’ foremost bespoke and ready-to-wear tailor, it has come to resonate deeply with the luxury menswear community, evident through its omnipresence across The Rake and its occupation of more product categories than any other on the store.The house was initially established as a bespoke outfitters in 1932 by Gennaro Rubinacci and is now headed by his son - the skilful and ever-dapper Mariano - and grandson Luca, a streetstyle icon in his own right, and a prominent and respected voice in the menswear industry. Over the years, the pair have worked closely to bring their joint vision to the family business, keeping it true to its legacy whilst carrying it into the 21st century. “Every day I learn something new from my father,” says Luca. “He is a great friend to me as well as a mentor - I love to argue with him and have fun with him, I'm lucky to have a father like that”. Between the two of them, Mariano and Luca have transformed a humble bespoke tailoring house into a hugely successful international luxury menswear brand that has garnered itself legions of followers. It’s not difficult to decipher why: the label is responsible for crafting some of the world’s most exquisite luxury menswear garments - from sophisticated suits and coats to intricately designed accessories, elegant loafers and luxurious knitwear. With its roots firmly in Naples, its sensibility aligns with the flair that the city is renowned for. It captures a relaxed, unstructured style that is distinctly recognisable through such effects as the signature Neapolitan 'spalla camicia' shoulder on its jackets - a bunching of cloth that gives the wearer a greater range of motion - the barchetta (‘little boat’) outbreast pocket; the extended front seam; the double stitching and the overlapping cuff buttons. Below, Luca shares with you his favourite picks from The Rake. Yet, the label also encompasses distinctly British influences, drawing from the sharp classicality of Savile Row. The effortless fusion of these two worlds makes for a truly unique aesthetic that has come to define the label and bleeds into all of its pieces. Some of its bestselling garments include its military-inspired Manny trousers and shorts - which have become a staple of regulars at menswear shows around the world; the supremely elegant Marphy leather loafers; wonderfully elaborate pocket squares and scarves and of course the label’s myriad single-breasted and double-breasted jackets, tailored to perfection with a feather-light touch. Such is The Rake and Rubinacci’s reciprocal allegiance that many of Luca’s own pieces are sourced from our online store. A man of impeccable taste, his wardrobe consists predominantly of Rubinacci of course, but it is peppered with items from the likes of Italian eyewear label The Bespoke Dudes, masterful British hatters Lock & Co. and the highly esteemed purveyors of quality leather goods George Cleverley. For grooming, he looks to shaving experts Mühle and Tuscan label Barbanera is his go-to for impeccably crafted footwear. 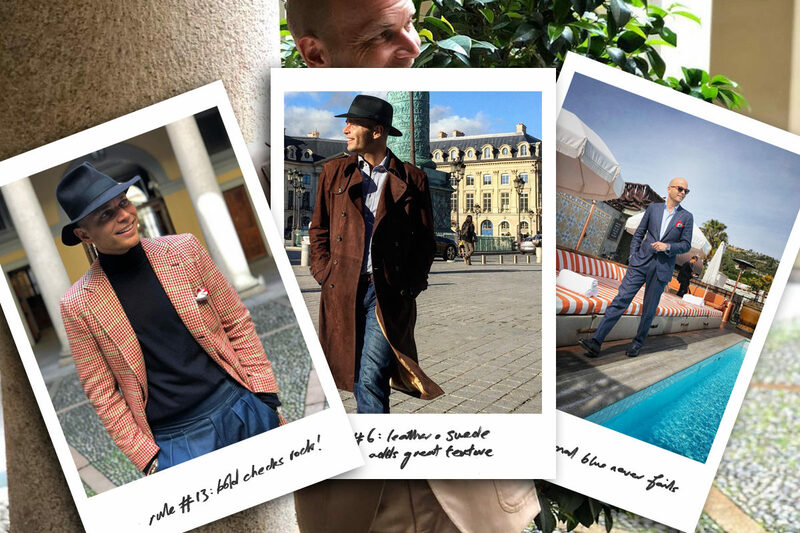 Having mastered a sophisticated yet seemingly effortless approach to styling, it is no surprise that he is so revered within the menswear world. His legacy - and that of the house of Rubinacci - will continue to inform our sartorial sensibilities, and for that we can only be thankful.